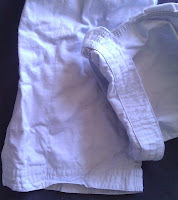 Short Review: A jiu jitsu gi tends to be a bulky item. It's normally thick cotton, which makes for a volume-munching lump in your backpack. However, gis made out of ripstop roll up nice and tight, dry quickly and weigh hardly anything (the Hitman is a tiny 900g). In terms of speed-drying and packability, it lived up to my expectations. 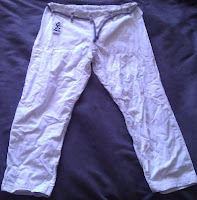 The extremely thin fabric also means it would be great for hot weather. Available here. Update June 2015: It appears that Gorilla unfortunately no longer sell the Hitman. Closest thing made by Gorilla is the Journey, a little heavier at 280gsm. The main disadvantage of that material is that it is much easier for your opponent to grab. I don't particularly mind that personally, as it just means I have to get better at breaking grips. So overall, I've been happy with this gi from Gorilla Fight Gear so far, as it does exactly what I wanted it to do, fulfilling the 'travel gi' role admirably. In terms of cost, the Gorilla ripstop is very afforable at only $89 USD (although shipping outside of Canada will of course bump that up considerably). Full Review: I've been interested in picking up a ripstop gi for a while now. Although they've somewhat fallen out of favour recently, seen as a passing trend, my reasons for wanting one haven't changed: I need a travelling gi (hence why I have a section for reviews of travel gis, here). That means something very light, quick-drying and compact. The ripstop perfectly fits the bill. If you've never heard of ripstop, its history apparently dates back to World War II, when it was used to make parachutes. Ripstop is commonly used for things like sails, hot air balloons and tents. 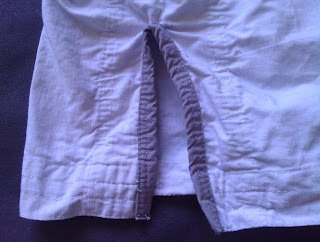 From what I gather it is not so much about the material, but the stitching method using nylon threads. That results in a trademark pattern of small squares, which are supposed to prevent rips spreading (hence the name). The ripstop gi uses cotton, but you can also get ripstop nylon, ripstop polyester, ripstop silk, etc. Ripstop fabrics are woven fabrics often made out of nylon, whilst using a special reinforcing technique that makes them resistant to tearing and ripping. During weaving (thick) reinforcement threads are interwoven at regular intervals in a crosshatch pattern. The intervals are typically 5 to 8 millimeters (0.2 to 0.3 in). Thin and lightweight ripstop fabrics have a 3-dimensional structure due to the thicker threads being interwoven in thinner cloth. Older lightweight ripstop-fabrics display the thicker interlocking thread patterns in the material quite prominently, but more modern weaving techniques make the ripstop threads less obvious. A similar effect can be achieved by weaving two or three fine yarns together at intervals. The best known ripstop gi brand is easily Kauai Kimonos. However, they're fairly expensive, and they're also a bit busy for my liking, with multi-coloured trim, patches and huge text along the shoulders. Gorilla Fight Gear's ripstop gi, despite the bling potential of the 'Hitman' name, is almost entirely plain (the picture on the right also gives you a close-up of the weave). There is just one patch on the arm, which isn't even easy to see, as it is light grey against a white gi. Aside from that, it also has two small Gorilla Fight Gear logo labels, on the trousers and the lapel. The Gorilla ripstop gi has some areas of contrast, such as in the stitching, a grey rope drawstring and side vents, but it's relatively subtle. In what appears to be another possible cue from fashionable brands, there is an inside pocket (on the site, it says this is 'chest level': presumably that's a mistake, as it is clearly above the hip). I don't compete, so I doubt it is something I'll ever have much use for, but a potentially useful addition for holding your gumshield or phone (as long as it doesn't catch fingers and toes). It also comes with a white belt, which hasn't been the case for most of the gis I've bought. I've read that on many ripstop gis, the collar can be thin and flimsy. That is definitely not the case with Gorilla Fight Gear's offering, which is decidedly beefy. The collar is made out of rubber, so I wouldn't recommend putting this gi in the dryer. Reinforcements are in all the usual places, by the trouser gusset, armpits, knees and on the side vents. 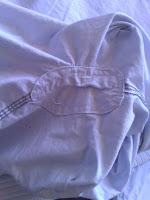 The trouser and sleeve cuffs also look heavily fortified with stitching. The trousers are secured with a bungee cord rather than the typical flat drawstring I'm used to. There are also five loops, meaning the rope is unlikely to move once you've tied it in place. I've read some reviews which say how ripstop trousers can become unpleasantly slimy and stick to the skin, but I haven't found that with the Gorilla ripstop. They certainly feel different to typical heavy cotton trousers when they get drenched in sweat, but I didn't notice any of the waxy stiffness some people have reported regarding other brands. As with any ripstop weave, the material is much thinner than a standard gi: according to the website, it's 250gsm ripstop fabric. That has the advantage of reduced weight and less sweat, but it does mean rather less padding for throws and the like (which I definitely noticed when I wore it at RGA Bucks, as the mats are much thinner and harder than those at where I'm training in Bristol). In terms of weighing scales, that comes out at a ridiculously light 900g for both the jacket and trousers (not including a belt). The jacket is made out of a single piece of cloth, so there aren't any large seams on the back. There were a few loose threads, such as on the armpit reinforcement, but nothing major. I washed it at 40 degrees Celsius with a spin setting of 900, then hung the jacket and trousers on door hooks. Four hours later, it was mostly dry, getting completely dry two hours after that. This was in an unheated bathroom in the UK, which isn't exactly known for its blazing temperatures. Either way, that means the gi would definitely dry overnight, so even if this was your only gi, you could easily wash and dry after training and still have a clean gi for the next day. I didn't notice enormous shrinkage, as you can see from the pictures. To work out how small this gi packs up, I pulled out a rucksack from the cupboard and laid out a bunch of shirts, a hoody, a book and a couple of DVD boxsets for bulk. I'm not quite sure what kind of awesome training trip would include watching the entirety of Mysterious Cities of Gold plus a season of Hercules, but hey: the Gorilla Ripstop left enough room for everything except the large book. By comparison, the Padilla & Sons single weave, which is a fairly typical size for a standard gi, couldn't manage my belt or the DVDs. I rolled up each of the gis in the same way: the ripstop gi jacket effectively packs like a belt, as the fabric is thin enough to wrap tightly around it. The 'Hitman' ripstop is relatively inexpensive, at $89 USD, especially as my sister's mother-in-law kindly took delivery of the gi at her home in Vancouver, then brought it with her during a recent visit to the UK. You can also get them in black, for $10 USD extra. I thought it was in Canadian dollars when I looked a few months ago, but either they've changed it or I just misremembered. I should note that when I just checked, most of the smaller sizes were sold out (I bought my A2 back in April, when only A1 was unavailable: clearly they've been selling well), so unless you're a bigger grappler, you may need to wait for new stock. Mike provides good customer service, judging by the email he sent me, so worth checking with him if you're uncertain about sizing. Nice review. I've heard little of the Hitman Brand, so it was good for me to get a detailed introduction. Much appreciated! @binster: Until Gorilla find a UK distributor, there is that ripstop from Grab & Pull, which is UK based. Worth checking Seymour's review. our hitman product line is more about being stealthy and getting the job done, that is why we went light grey on white subtle and clean but still not plain. Even with the rubber collar my hitman gi has hit the wash and dryer at least 2 times a week for the last 6months with no issues, due to the fact that the gi was already preshrunk so shrinkage was minimal, which meant the warping of the collar was unnoticeable. the reason why our ripstop doesn't get this slimy waxy feel as due to the fact that we went 100% cotton. That also reminds me: you can put in your measurements here to send through to Mike, who will then let you know what is probably the best size to go for. @Georgette: Thanks! Yeah, there are a few doing them aside from Kauai now. The ones I'm aware of are Gorilla, Grab & Pull and Ground Control (although I'm not sure they're still selling them: they were the ones that had the collar in rank colours). There are probably a few others too: I think that Hayabusa one with the unfortunate scribbling all over the shoulders is ripstop too, but not sure if it's just the trousers.